Okay, I didn’t actually type this with the messed up foot, but the foot did think up most of the good ideas in this post. I’m still nursing the stitches and happy to say they’re healing well. I’ve opted for the maddening route of not walking on it at all until I get the stitches out to speed the process and get me back in the water as fast as possible. That means I’m in our apartment all day, hopping around on one foot from the palapa on the roof to our place on the ground floor. We just learned that they stopped renting crutches in Puerto because so many people didn’t return them. So, anyone following in our path, remember to pack your own crutches. With all this down time I should be posting here a lot, but I’ve been suffering from wave withdrawl, particularly now that a new overhead swell just filled in, and instead have been doing a lot of extremely technical hammocking with a book or the Kindle (see item 6 below). 1) Dell inspiron Mini 1012: We decided that we needed a keyboard since writing is a big focus of our trip and despite some drawbacks, this little computer seemed to fit the bill. The piece of duct tape on the lid is a brilliant theft deterrent strategy. It has an Atom N450 processor that runs at 1.67 ghz – so it’s not exactly fast, but fast enough. The size and weight are pretty standard for netbooks – weighing in at under 3 pounds (1.37 kg for our friends everywhere but the US) and measuring 10.5 x 7.8 x 1.0-1.3 inches (268 x 197 x 25.5-32.8 mm). Also pretty standard, it has 3 usb-2 ports, a VGA connection for an external monitor, an ethernet connection and jacks for headphones and a microphone. We’ll write another post on the programs we use to make this thing as functional as possible. Pros: It has a nearly full-sized keyboard (92% of the real thing) so typing is painless. It also has a good, clear monitor. With the 6 cell battery it has a maximum run-time of over 8 hours (though 6.5 seems more realistic when actually using a few apps). It also has upgradeable RAM (which many netbooks don’t have) so we went to http://www.crucial.com and upgraded it from the 1 GB it came with to 2 GB for about $35 US and it really seems to make a difference, running everything we need with decent speed and no crashing. It also has a card reader – so we simply insert the SD cards that all our cameras use into the slot on the side and we can instantly view and download all our pictures. One of the best things about this is that when we got it last year the list price was less than $300 and we got it through our cell phone carrier as an upgrade for an old account for less than $100 and then never activated it (perhaps not our most ethical move, but it was a cellphone company!). They’re still available from Amazon for about $250, and even at that price it wouldn’t be a major expense to replace, unlike the Mac we left at home. Cons: As many users have noted the track pad is dismal – one of the worst I’ve ever used (hence item 1c). It also has pretty weak speakers, which is hardly surprising – they’re adequate for watching a movie or quietly listening to music, but don’t plan any parties, or expect this to compete with even moderate noise competition. And finally, it comes with Windows 7 Starter, which probably would have been fine, but it doesn’t support VPNs (which we’ll talk more about in another post) so we upgraded to Windows 7 Home Premium (a legit copy – very kindly provided by my brother-in-law Ian). 1a) A decent sleeve that fits the Dell perfectly – $13. 1b) The power adapter for the Dell – a bit bulky, but it has a light on the end that plugs into the computer so you know it’s actually charging. 1c) Logitech travel mouse. As noted above, the main drawback to the netbook is the lousy trackpad, so we brought this – small, durable and about $12. 1d) The back-up discs for Windows 7 Home, device drivers and MS Office. 2) Samsung Ultra Slim external DVD writer – like all netbooks, the Dell doesn’t have an optical drive and while it’s not mandatory we decided to bring this along for two main reasons: 1) if we ever need to restore the system it’s infinitely easier with the drive, and 2) it’s nice to be able to watch a DVD every once in a while (particularly when you’re injured). This drive is small and very light (less than 12 ounces) and seems pretty durable. It cost less than $40 at B&H in New York. 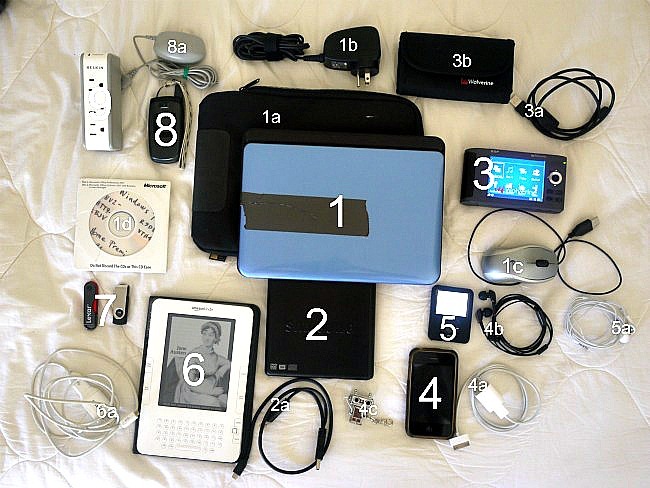 2a) The cable for the drive uses 2 USB ports – but the external hard drive we brought (item 3) uses the same set-up, so we left one of the cables at home. 3) Wolverine ESP-5000 External Hard Drive with card reader – This 250 GB external hard drive has built-in card readers and a full-color screen. So we can directly download, view and edit our photos here. It also acts as a regular external drive so we can back up all our documents from the computer here. It was about $300 (thank you AMEX points) last year at B&H in NY. And while it’s been discontinued, there are a lot of similar products available. So far this hasn’t gotten much use as we’re using the card reader on the netbook and backing up documents in Google Docs, so we’ll see if this lasts the full trip. Comes with a soft case 3b). 3a) Charging cable for the Wolverine drive. As I noted in 2a, above, this shares a two-USB data transfer cable with the Samsung DVD burner – this cable allows its battery to charge from the computer’s USB port and also doubles as the charging cable for our GoPro digital camera, which you’ll meet in the upcoming Photo Gear entry. 4) iPhone 3 – very generously bequeathed to us by my sister, Elisabeth. We only use it on wifi networks for checking internet and making Skype calls, but it’s an incredibly handy and discrete alternate to pulling out the netbook. Plus we’re able to download apps and use them – I got a (questionably accurate) pedometer app so we could see how far we were hiking into town (~2.3 K). 4b) Earbud headphones with a microphone for making Skype calls on the netbook and the iPhone. Came free with a Blackberry last year. 4c) Robot headphone splitter – another awesome present from my sister Elisabeth. This allows us to both plug our headphones in and listen to the same device. 5) iPod Nano 16GB – so far it hasn’t gotten any use, but it’s small and I’ve had it for years so, what the heck. With the inevitable white headphones 5a). 6) Amazon Kindle – another amazing present, this one from our friend Kim. We had long debated whether we’d bring one of these on the trip and we would have been beating ourselves with giant, hard tortillas if we hadn’t. We have a subscription to the NewYorker and get new issues every week, plus there are thousands of public domain books and (as Delphine noted earlier) library books available. It’s amazing we don’t fight over this thing more often. I did download the Kindle app on the netbook too, so we can both read the stuff in our accounts. One of the greatest uses for the Kindle though, is travel books – Lonely Planet guides are all available on it, which saves us a huge amount of weight carrying them and inconvenience tracking them down in foreign countries. We will definitely replace this if something happens to it. Has its own 6a) charger. 7) USB memory sticks – the best way to physically back-up files and safely store away from the computer. We have a 4 GB and a 2GB. The 4 GB was an incredibly cool gift from our friend Alan, who loaded it up with episodes of This American Life and RadioLab. 8 ) A cheap unlocked Nokia quad-band GSM phone – we used this with a pre-paid SIM card during our stay in Montreal and it was incredibly useful having a local phone during that hectic time. We haven’t put a SIM in it in Mexico, but we’ll see if it makes sense in any of our other destinations. $35 shipped from Amazon. With a somewhat bulky charger 8a). 9) Belkin Travel Surge Protector – three grounded outlets and two USB ports on the top means we can charge all our devices without worrying about questionable power as we travel. $25. So that’s the lot. Let us know if you have any questions. And please, if you have any suggestions on using or tweaking anything in this collection, drop a line. I have a Kindle and I think it is possible for me to lend you books. I just have to figure out how. Standby and I’ll let you know, if you are interested. I just checked and some books are loanable, but the terms seem to vary. We only have one that can be loaned and it’s possible to loan it once for 14 days. I’m trying to figure out now how we can show the lists of books we have to one another. Any idea? Okay, this foot injury/not surfing thing is getting BAD. That’s a helluva lot of tech info you just put down. I will pray for you…. I love my brother and new sister.